US Cable operators face tremendous challenges and great opportunities over the next year. Analysts see a healthy pricing environment and falling capital intensity offset by increasing competition and a lack of the capital structure driven changes that drove performance in ‘10. Please find next the key trends that cable operators will face during 2011. 1. Public battles will escalate regarding the “market” cost/price of content both TV and online. A big theme in ’10, and likely ’11 as well – retransmission/affiliate battles went deeper than previously seen with both cable networks and local TV stations being dropped by cable/satellite operators and some new agreements (HBO/DTV) taking much longer than expected to settle over digital rights payments. 2. Pricing environment to remain healthy in 2011. A neutral fundamental outlook on the cable and satellite TV sub-industry group reflects rising concerns about the potential impact of “cord cutting” on consumer subscriptions for entertainment and communications services. While a recovering capital market seems to be filtering into an increasingly upbeat tone for the M&A environment, in the near term, analysts see continued liquidity constraints for a number of the sub-industry constituents, some of which could also be affected by further changes in the regulatory environment (e.g., network neutrality). On top, increased pressures on pay-tv subscriber growth, amid the proliferation of Internet-delivered (also known as “over-the-top”) video outlets. For 2011, it is expected that “battle of the bundles” will intensify among providers of video, voice and data services, even as high-definition (HD), video-on-demand (VOD) and digital video recorders (DVRs) and other advanced offerings gain further penetration. We see current efforts also geared to the deployment of ultra-fast wireline broadband speeds, integrated voice services, and wireless broadband offerings. But Is cord-cutting taking place? Operators are generally not behaving as if they are concerned by continuing to push up video prices (with broadband in many areas). Led by DISH (nearly +10%, though with a commitment to holding rates in ’12) and TWC (+8% standalone video and as much as +10% standalone broadband in certain markets) …we see price increases generally similar to 2010. In our opinion, Netflix appeared to dominate investor debate in media in the second half of 2010. The good news is cable & satellite operators along with film studios are immensely more focused on the opportunities and risks associated with over-the-top services as a result of NFLX’s marked success than they were a year ago. Additional entrants (GOOG, MSFT, AAPL) will enter in this space in one shape or form in ’11 while the incumbents all deploy TV Everywhere services. Online TV distribution models will likely move from experimentation to broad deployment/adoption in 2011. 3. Cross-product unit growth likely to decelerate in ’11, although Pay-TV adds may stabilize – or increase if housing improves – and commercial services provide continued growth for cable. Analysts forecast Telco TV additions of ~1.4 M in ’11, versus ~1.65 M in ’10. 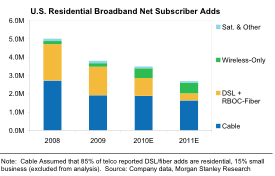 In broadband, we see net additions down as the overall residential broadband industry grows a very modest 4-4.5%, though the overall pie may expand faster in the wireless-only arena where price points may be lower. Overall we expect cable to take just over 60% of the slowing number of residential broadband net adds (vs. ~55% in 2010). Looking specifically at wireline, we forecast cable taking nearly 80% of adds in ’11 versus ~65% in ’10. 4. Growth in online video consumption in the home will create pricing power for cable/telco access providers. Broadband ARPUs as expected turned nicely positive in ’10 despite the net neutrality overhang, and analysts expect more of the same in ’11. 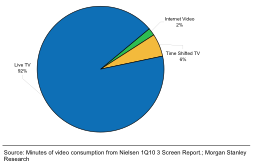 TV still dominates, owning the vast majority of video consumption today, but Internet video and Time Shifted TV will significantly increase their usage shares. 5. Rate of growth in EBITDA less Capex expected to slow: Over the last several years, capital spending has declined steadily. However, with roughly 50% of cable capital spending now variable customer premise equipment and much of that activity tied to normal course truck rolls and set-top box installations/upgrades (and with cable unlikely to move to a “thin client” architecture in the near-term), we expect to see capital spending flatten out. Key question: As the U.S. consumer, particularly the higher ARPU tech-savvy consumer, is being won over by the likes of Apple, Netflix, and GoogleTV’s improved navigation, search and discovery tools, how can Cable/Satellite operators respond? TV Everywhere will be the initial push, however, we believe the real battle is not over peripheral devices – it’s over the living room TV. That will require a more intelligent, elegant, and ultimately Internet connected guide in the set-top…which could be more expensive and take longer than anticipated depending on the necessary time to market. Cable operators face intense competition in all markets from other providers of pay-TV, high-speed Internet and phone services. Their primary competitors for pay-TV include DirecTV and DISH Network — the two major direct broadcast satellite (DBS) providers. Cable operator’s high-speed broadband (cable modem) service also goes head-to-head with incumbent telephone companies’ DSL service from Verizon and AT&T (whose territories respectively overlap its cable footprint by about 40% and 30%), both of which also offer wireless phone service. While cable operators continue to accelerate new digital phone services, the telcos are experiencing continued steep declines in access lines (versus relatively healthy gains in wireless voice subscribers). Conversely, led by Verizon and AT&T, the telcos, already in strategic bundling partnerships with DBS providers, are also aggressively encroaching on cable’s turf, as they roll out their own fiber- based video (as well as broadband) offerings — in a move aimed to compete head-to-head with cable operators. Meanwhile, both Verizon and AT&T were bid winners at the FCC’s 700MHz auction, expected to be deployed by the telcos to build out a 4G wireless network. 6. Despite improving macro trends, triple play subscriber growth will likely decline from ’09. Triple play sub trends were even worse than expected in 2010, with pay-TV industry totals turning negative in 2Q10 while both broadband and voice industry results fell short of expectations. The good news in ’11 is that the industry will not face the digital transition comp that hurt YoY compares in ’10. The bad news is that housing remains weak while alternative entertainment options are growing in availability and quality. 7. Cable will increasingly turn to the commercial customer to drive growth, taking on incumbent telcos. SME did in fact lead the way in terms of revenue growth for the cable industry, particularly in the U.S. Market share levels are now north of 20% in some areas like CVC, and the lack of a wireless offering has yet to limit share gains. While the easy share wins are likely behind us, this is a business where improving economic trends are likely to create a nice tailwind in ’11. 8. The Comcast-NBCU regulatory review will likely touch on multiple industry themes and in particular, net neutrality, program access, and local media ownership. The big surprise of ’10 came from the courts, when the FCC’s existing net neutrality guidelines were rejected, setting off six months of intense concern over the future of broadband regulation. Ultimately, the industry arrived at a place where pricing flexibility was maintained and the old requirements more or less re-emerged in a different form. 9. A pick-up in the M&A environment has also been reflected by some major strategic deals including Comcast’s potentially transformative control of NBC Universal, Liberty Entertainment Group’s merger with DirectTV, as well as the acquisition of Bresnan Communications by Cablevision — which recently announced plans to spin-off its Rainbow programming unit. Meanwhile, several highly leveraged constituents, including Sirius XM, have successfully refinanced their debt, while others such as Charter Communications have emerged from bankruptcy reorganization.